CD, 7 tracks, 52 mins. The first album by Benny Nilsen for Ash International. Benny founded Hazard in 1996 after a couple of years in several local ear-peaking guitar bands. Has since then been taking more and more interest in extreme weather conditions and its effect on humans – field recordings and the perception of time and space as experienced with sound. Hazard is the relatively recent incarnation for Sweden’s Benny Nilsen, who at the tender age of 16 put the Cold Meat Industry label on the map with his excellent Lustmord-style This Crying Age CD, released under the name Morthond. That classic from 1991 took industrial-ambience to a new level of suspenseful atmosphere, as a clock sound ticked as if towards the doomsday scenario of five minutes to midnight. Later, the young Benny was seduced by the sound of Ministry, taking Morthond/Morthound into an overpopulated industrial-rock area. Now with Hazard he is back to the profound ambient overpopulated North deepens his exploration into dark ambience, creating an equation between Europe’s polluted grey wintry textures and the first world’s technological automata that drone on as nature rests. Hazard adds a new narrative arrangement to the sounds of Thomas Koner, as tracks like “Absence Of Presence” and “Wound/Impact” feature cascades of metallic waves behind idling motor oscillations and cutting foreground scrapes, for an overall effect of one of the Hafler Trio’s pseudo documentaries. Benny Jonas Nilsen founded Hazard in 1996 and is now apparently an ‘active recording workaholic’. Judging by his discography, this is true enough; no prolonged Elastica-style hibernations for this Swedish muso – he’s crammed loads into the last 3 years. And this is the most recent effort. Available to buy now, ‘North’ finds him in filmic mood – lots of bizarre noises and tension-filled tones fill this eerie soundtrack-esque album. It’s pretty chilled out stuff. Opener ‘Wire Netting’ takes a while to get going as does ‘Tangled Mess’. ‘Grey Speed sounds uncannily like a robot and ends as quickly as it somewhat confusingly began. ‘Absence or Presence’ and ‘The Vibrating Room’ have the beginnings of a tune and are – yes- atmospheric but very technical – a description which fits most of this album. Second album of Hazard aka B.J. Nilsen who’s better known as mastermind of Morthond/Morthound. With Hazard, the artist goes further than with Morthond. The music is more extreme, but only concentrated on a composition with less sounds (sic). This is the right sound to accompany a dark movie or documentary. The front-page illustrates a winter landscape full of snow and that must have been probably (sic) inspired the composer. I easily imagine these dark and cold winter days in the icy north which on the long run lead you into a state of loneliness and depression. That’s exactly the feeling I get when I’m listening to ‘North’ and from this point of view, it’s a well done production which will only please to (sic) a few number of people! Two recurrent themes with the Touch/ASH unit resurface here, both stamping their authority on what is essentially a purely scientific documentative process, echoed globally with the likes of Staalplaat etc. Hazard’s ‘North’ is a continuation on the forces at work within the symbiotic relationship between extreme environmental phenomena and extreme noise. Whereas Touch operatives like Chris Watson tap the directional vector from pure environmental source to tonal representation, Hazard works the reverse direction and uses treated sounds, tones and samples to evoke visions of his cold, barren and unforgiving Swedish landscape. 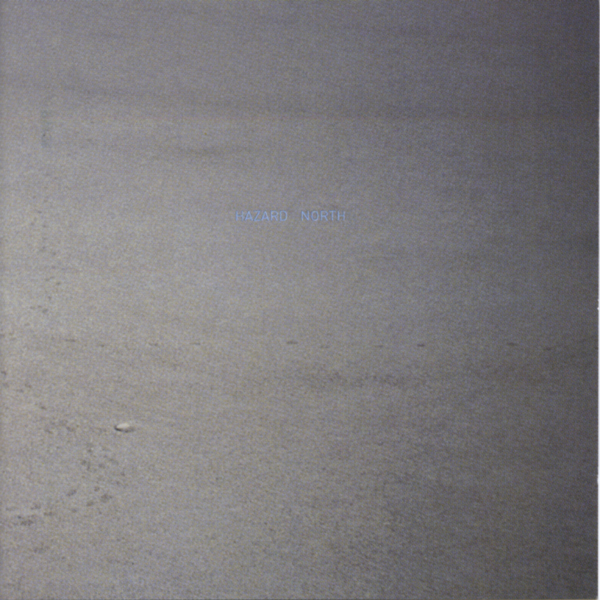 A couple of tracks manage to match the sonic achievements of Ikeda’s and Vainio’s solo works providing sweeping electronic blankets and beat-less slabs of noise (especially the opening and closing pieces). There’s a twisted sense of complacency in the tracks such that they are almost guaranteed to find favour anyone who has followed the industrial scene from its early days (Hazard’s Benny Nilson draws on influence’s from ‘old school industrial’), but the challenge still remains for an effective fusion of ‘new school industrial’ with techno. Certainly Pan(a)sonic occupy this territory, and further openings have been forced by the few willing to push the electro envelope,… however you can’t help feeling that if this release outstripped its inevitability of picking up the heavy tag of ‘experimental / art gallery music’ then the year 2000 would provide something more exciting than the millennium bug. Benny Nilsen’s bleakly beautiful Morthound albums helped to define the post-industrial palette of Sweden’s Cold Meat Industry label. Nilsen’s more experimental Hazard recordings expand upon the stark synth atmospheres of Morthound with field recordings and noisier, overtly electronic elements. WOOD, the CD component of a limited release that also includes the BRIDGE/FIELD LP, incorporates sounds culled from cellulose and woodland field recordings into layers of sculpted electronic drone. Throughout the arresting and accomplished WOOD, Nilsen artfully imposes incident upon environmental ambience. Processed samples infuse the wintry, nearly subliminal melodies of “Cut Out/Replay” with naturalistic texture and grain. The opposite is true of “Location South” and “Cords and Branches,” where the stilled soundscape of a deep-forest marsh is rendered surreal by the addition of metallic rustlings and scrapes and ominous, distant-thunder electronics. “Fibre Test” and “The Logfire” offset the quiescent, Terry Riley-like mantric minimalism of “Pylons” with Hazard-ous sonic suggestions of conflagration and calamity.